Be the first to share your favorite memory, photo or story of Audrey. This memorial page is dedicated for family, friends and future generations to celebrate the life of their loved one. 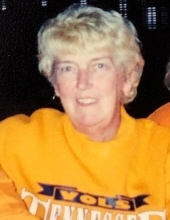 Audrey Dionne Racine, age 71, of Knoxville passed away suddenly on Saturday morning, November 29, 2018, at her home. Audrey was a graduate of Wahconah High in Dalton, Massachusetts. She served in the United States Army. She worked as manager at Sears for 25 years. After retirement she moved to Knoxville with her husband and worked at TJ Maxx. Audrey is survived by her husband of 35 years, Richard; daughter, Joanna Tatro of Los Angeles, California; son, Donald Tatro of Pittsfield, Massachusetts; grandson, Donald Tatro, Jr; sister, Jean Costa of Knoxville; brothers, Thomas Dionne of Lowell, Massachusetts, Wade Garrison of Gastonia, North Carolina, and Donald Dionne of Springfield, Massachusetts; several nieces and nephews. Family and friends will gather at 11:30 a.m. on Monday, December 10th at the East Tennessee State Veterans Cemetery, 2200 East Gov. John Sevier Highway for services with full military honors conferred by the East Tennessee Veteran’s Honor Guard and the United States Army. Click Funeral Home and Cremations is serving the Racine family. To send flowers or a remembrance gift to the family of Audrey Dionne Racine, please visit our Tribute Store. "Email Address" would like to share the life celebration of Audrey Dionne Racine. Click on the "link" to go to share a favorite memory or leave a condolence message for the family.